Most people with Down syndrome find it difficult to speak clearly enough to always be understood by everyone around them. These communication difficulties can present obstacles to learning, friendships, employment and independence. Research has begun to explore the nature of these speech difficulties and to inform therapies. More research is need to explore effective interventions. Most children and adults with Down syndrome have speech production difficulties that lead to them not being understood. Libby Kumin surveyed over 900 parents and 60% reported that their children 'frequently' had difficulty being understood and a further 37% reported that their children 'sometimes' had difficulty being understood. This degree of unintelligibility can be frustrating and seriously impairs communication in all aspects of daily life. Typically developing children are largely intelligible by about 4 years of age. Little is known about the reasons for this pattern of speech difficulties, but there have been a small number of intervention studies each showing small gains in sound or word production. [6-9] One study indicated that as the children's phonology improved they began to be able to produce longer utterances. 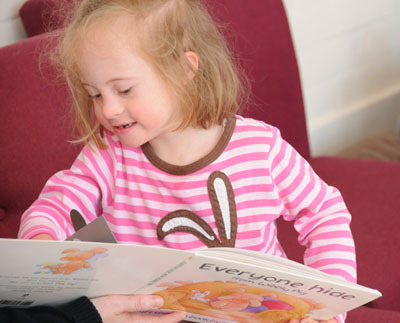 Improved understanding of the speech difficulties experienced by children with Down syndrome has informed early intervention and speech therapy recommendations, and the development of resources to support regular speech practice. Kumin, L. (1994). Intelligibility of speech in children with Down syndrome in natural settings: Parents' perspective. Perceptual and Motor Skills, 78, 307-313. Dodd, B.J. & Thompson, L. (2001). 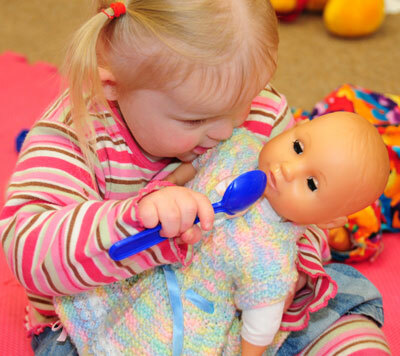 Speech disorder in children with Down's syndrome. Journal of Intellectual Disabilities Research, 45, 308-316. Dodd, B., McCormack, & Woodyatt, G. (1994) Evaluation of an Intervention Program: Relation Between Children's Phonology and Parents' Communicative Behavior. American Journal on Mental Retardation, 98(5), 632-645. Cholmain, C.N. (1994) Working on phonology with young children with Down syndrome. Journal of Clinical Speech and Language Studies, 1, 14-35. Dodd, B. Crosbie, S. (2005) Phonological abilities of children with cognitive impairment, In Dodd, B. (Ed.) Differential diagnosis and treatment of children with speech disorders. (pp.233-243) London: Whurr. Van Bysterveldt, A., Gillon, G & Foster-Cohen, S. (2010) Integrated speech and phonological awareness intervention for preschool children with Down syndrome. International Journal of Language and Communication Disorders, 45 (3) 320-335.